Welcome to day Six! Again this is another one that the cover just sells the book! These two covers (book 1 and 2) are just breath taking! Philomena Blackwell survived a city plagued with monsters, the gilded cage of high society, and the rule of a heartless man... and she aims to leave it all behind. It's 1905, and London has finally been freed from Henry Jekyll's terrible legacy - its people cured, its thirteen-year quarantine lifted. The world is waiting, and for a girl who dreams of being its most dazzling star, what could be more enticing than the bright lights of New York City? She is drawn across the ocean like a moth to a flame, her heart set on proving that while she may be small on the outside, her soaring talent eclipses even Manhattan’s towering skyline. When she lands a big break, it seems as if the city is ready to fall under her spell - just as she seems to be falling for a handsome young stage manager. But is it her stage presence mesmerizing the audience, or something more sinister behind the scenes? 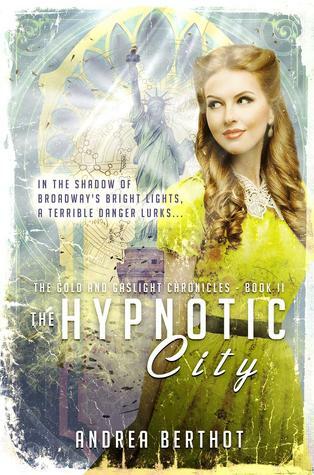 Both fans of The Heartless City and new readers alike will enjoy this stand-alone / spin-off tale of Philomena’s adventures on stage - and in love - in NYC. Andrea Berthot’s last name has a silent “t,” like the word “merlot” - which fits, since that is her favorite drink to have at the end of the day. She grew up loving singing, acting, reading, and of course writing. By day she teaches high school English, creative writing, and drama, and by night (or rather, by early morning, as her brain is more alive at 5am than 5pm) she writes Young Adult stories involving history, romance, and magic. She lives in Winfield, Kansas with her husband and their two sons, Maximus and Leonardo. We meet new characters and see some old friends. The story is vivid and you will turn those pages fast to get to the end! Its a true rags to riches story with a Cinderella feel. I feel at a loss for words on how to review this amazing read.